It has been an unusually mild spring here in Southeast Texas where I live. In most years, by this time we would be suffering with daily temperatures in the 90s F. This spring, though, temperatures have stayed more moderate with some cool nights even into May. And, thankfully, we have continued to get some occasional showers. All in all, not a bad spring. The plants have loved it! May, of course, more than any other month, is full of flowers, too many to catalog them all, but here are a few of the ones that are brightening my garden this Bloom Day. Weighed down by raindrops from an early morning shower, this is the first bloom for this bicolor yellow and white datura. I planted from a mixed seed packet of datura, so I had no idea what I would get, but I quite like this one. The 'Litchfield Angel' rose is almost open today. 'Belinda's Dream' almost always has blossoms open. 'Mystic Spires' salvia is in full bloom. As are the old species cannas. Orange bulbine, another constant bloomer. Oakleaf hydrangea, my favorite among the hydrangeas. 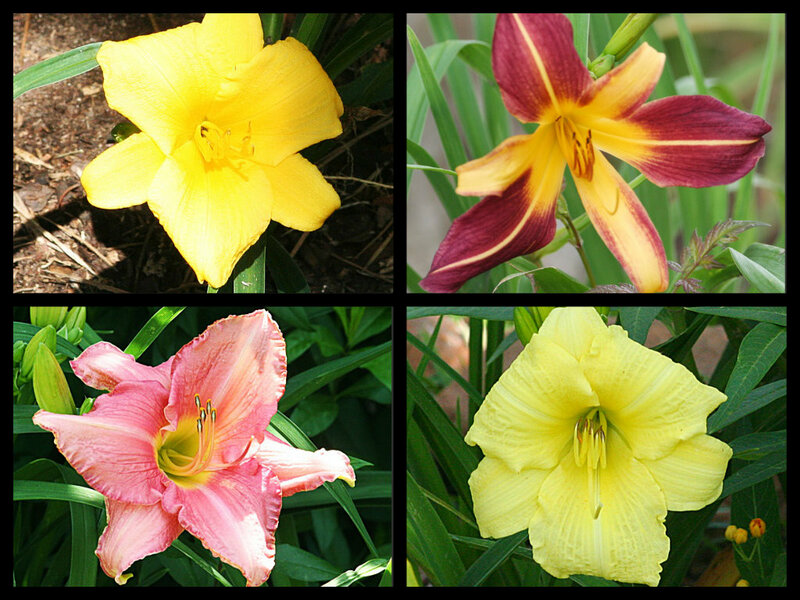 Several of the daylilies are in bloom. Their variety names are lost in the mists of my garden's history. The groundcover wedelia is opening its daisy-like blooms. And some real daisies, the Blackfoots, are open, too. The miniature rose, 'Red Cascade' is full of these tiny flowers, which still show the effects of the morning's rain. Copper Canyon daisy is blooming. New Guinea impatiens brighten pots in the shade around the yard. While wax begonias provide color in sun-drenched pots. These plants may look fragile but they are tough. They can endure heat and drought and keep on blooming. 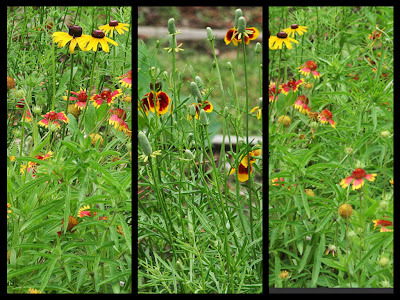 In the wildflower garden, various coneflowers, rudbeckias, and blanket flowers are blooming. The Justicia 'Orange Flame' is attracting a lot of attention from the garden's hummingbirds. The so-called blue hibiscus, Alyogyne huegelii, has been in bloom since the day I planted it several weeks ago. I'm told that it will bloom all summer. We'll see. Thanks to Carol of May Dreams Gardens for again hosting Bloom Day and thank you for visiting my garden this month. Gorgeous flowers, Dorothy! It's been a cool spring here and many of mine have yet to bloom. But we're grateful for cool and rain. Oh, yes! Let's enjoy it while it lasts. We know summer is coming. So many beautiful blooms. What is the coneflower with the drooping red/yellow petals? Is that Mexican hat? I love the Justicia and 'Litchfield Angel'. 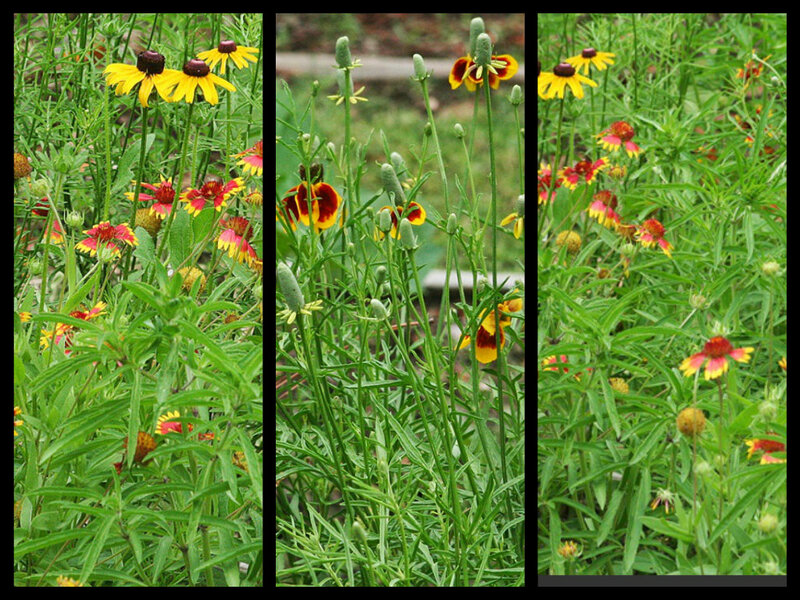 It's prairie coneflower, also commonly called Mexican hat. What an interesting Datura. I'd love to see another picture of it completely open. I enjoy your blog very much! Thank you. I'll probably be posting more pictures of the various daturas from the packet of seeds I planted over coming weeks. I'm very interested to see what the others will look like. Beautiful blooms...the 'Mystic Spires' Salvia, in particular, is stunning! 'Mystic Spires' is a favorite of mine. That yellow and white datura is lovely. I have purple and white. Belinda's Dream is my favorite pink rose, and I have Red Cascade. Wax Begonias are one of my favorites. Obviously, our gardens have a lot in common! The datura is even prettier when it's completely opened and dried out. I still have a couple of plants from that seed packet that haven't opened yet. I'm impatiently waiting to see what colors they will produce.